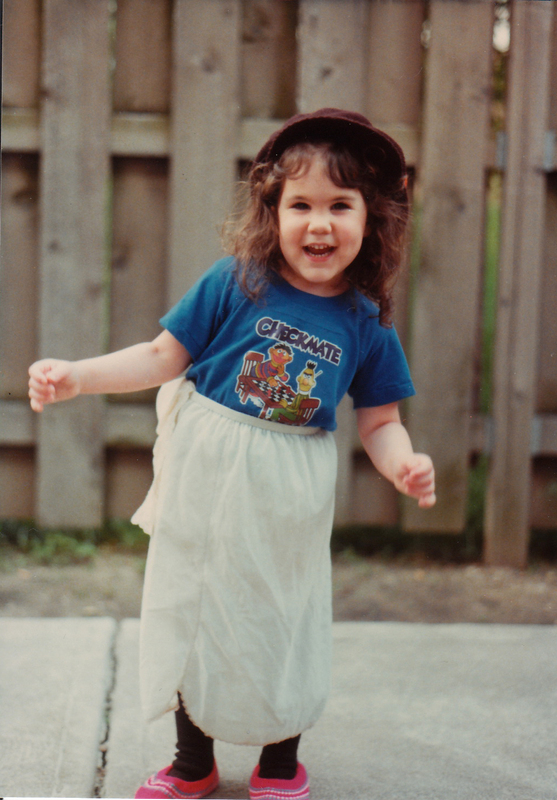 If you played dress-up as a kid, you probably had certain items you just LOVED to wear. Well, so did I ... but, as you can see from the picture above (taken in 1984), they weren't exactly typical dress-up clothes. Actually, most of what I'm seen in here is just my normal clothes, spruced up a bit with some extras I thought were fun. Now, what really made this a dress-up outfit was, of course, the slip. It was my mom's, and I just felt SO elegant every time I put it on. I really don't know where the newsboy cap came from -- I think it was my dad's -- but I have to say I'm digging the hipness it provided the look here. That Bert & Ernie T-shirt? It was kind of my favorite thing ever. I wore it constantly and just felt SO cool whenever I had it on. But what REALLY made me happy were those little pink knit shoes. I thought of them as my take on Dutch wooden clogs -- the picture is cut off a bit, but they had the same pointed toes. They were my first real shoe obsession. Sadly, I have no idea what happened to them, but I'm glad they are immortalized here. So there you have it. Not quite a dress-up outfit, but not quite your typical everyday outfit, either. And it made me happy, which is pretty obvious from the big smile on my face (and what I'm pretty sure were my first dance moves). What was your first dress-up outfit like? Let me know in the comments!